A late spring can bring feelings of malaise and tiredness. One of the tonics common to Orkney last century involved catching snails late at night, when they have a quiet feed, suspending them on a string in front of the fire, and catching the oil in a cup. Snails were used for other remedies. They were dissolved, complete with shell, in vinegar, as a treatment for rickets. Snails’ heads were believed to contain a substance which reduced fever. A septic finger was tightly bound with a dressing containing a black snail, so that the poison would leave the finger. Another cure for infected cuts, or for bruising, was fresh cow dung, which was also used for bee and wasp stings. Cobwebs were always left in byre rafters and windows, as disease preventatives, and to bring luck. Bound on a cut, the fibres, resembling the fibrin in the blood, helped it to clot. The elder tree was used in many ways. The pith was boiled with lard to make an ointment for sprains. A lotion from its flowers cured sore eyes, and the berries were used to treat sores. The fungus known as Jew’s Ear, which grows on elder trees, was thought to cure sore throats and quinsy, perhaps because of the belief that Judas Iscariot hanged himself on an elder tree. 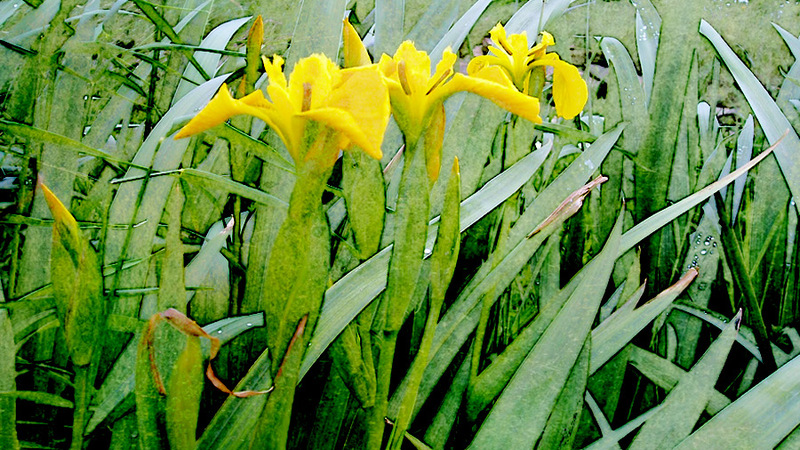 Yellow iris, one of the commonest of wild flowers in the islands, was thought to cure stammering, if the leaves were chewed. The juice of the roots, when crushed, was inhaled to relieve toothache. Wood sage was known as gulseck grass, from the Norse for jaundice, gulsott. It was infused in boiling water, and drunk. If that failed, and the jaundice persisted, the sufferer had to go to the smithy, steal a piece of rusty iron, wash it in water, and drink the resulting liquid. Only stolen iron was effective. Earache could be cured by taking a limpet from the rocks, removing most of the flesh, and boiling up some of the liquid in the limpet shell on a red-hot coal. This was cooled, and poured into the sore ear. There was no point in trying to stop an ear from discharging, because it was supposed to be the poison draining from the body. Roast mice were given to children with whooping cough. Fried herrings straight from the pan were split, and tied to the feet, to draw out the fever. I should think they would have had to tie the patient to the bed as well. The most powerful cure of all was to kill a black cat, which was placed on the stomach of a person with abdominal pain. This was a last resort cure for horses with colic. When a horse died, or was killed, the fat was removed, and boiled up with the marrow from the leg bones. This was supposed to be valuable as a liniment for strains and sprains. People with rheumatism had the affected area thrashed with young nettles, perhaps as a counter-irritant. It was unwise to wash the feet too often, a wise precaution in the days of bovine and human tuberculosis. In remote islands there was no doctor, and no alternative to home remedies. Teeth were pulled out at the smithy, by the blacksmith, who had powerful arm muscles and strong pliers. Howdie wives delivered the babies and laid out the dead. It is interesting to speculate about the results of such remedies, but the hardihood of the people who could endure them is remarkable. From the book Orkney Days by Christine Muir. A few copies of the book are available from the author for £11 by cheque including P&P, from Garso, North Ronaldsay, Orkney KW17 2BG. Christine is a Leith lass, who has lived in North Ronaldsay all her married life, and brought up four children on the croft, with her husband Tommy. She loves languages, history, writing, music, and her family. She also loves the Open University, which encouraged her to study for three degrees, and enabled her to teach, proving that distance is no barrier to learning.